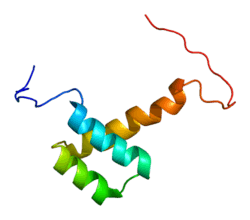 Homeobox protein OTX2 is a protein that in humans is encoded by the OTX2 gene. This gene encodes a member of the bicoid sub-family of homeodomain-containing transcription factors. The encoded protein acts as a transcription factor and may play a role in brain and sensory organ development. A similar protein in mice is required for proper forebrain development. Two transcript variants encoding distinct isoforms have been identified for this gene. Other alternative splice variants may exist, but their full length sequences have not been determined. Otx2 is a group of homeobox genes that are typically described as a head organizer in the primitive streak stage of embryonic development. Otx2, which is an encoded protein that plays the role of a transcription factor, has also been shown to be involved in the regional patterning of the midbrain and forebrain. This group of genes demonstrates later in progression to have an influence on the formation of the sensory organs, pituitary gland, pineal gland, inner ear, eye and optic nerve. Otx2 not only has a prominent role in developing this area but also aids in insuring that the retina and brain stay intact. This group of genes has a huge role in development and if it is expressed incorrectly it can have detrimental effects on the fetus. Otx2 mutations have also been associated with seizures, developmental delays, short stature, structural abnormalities of the pituitary gland, and an early onset of degeneration of the retina. A “knockout” model on the group of Otx2 genes has been performed to see what effects it would have on the adult retina. It was found that without the Otx2 gene expression there was slow degeneration of photoreceptor cells in this area. Thus, proving that the homeobox genes of Otx2 are essential in forming a viable embryo. Mutations in OTX2 can cause eye disorders including anophthalmia and microphthalmia. It has been shown that if Otx2 is over expressed it can lead to childhood malignant brain tumors called medulloblastomas. Duplication of OTX2 is involved in the pathogenesis of Hemifacial Microsomia . Recent research has identified the homeoprotein Otx2 as a possible molecular ‘messenger’ that is necessary for experience-driven visual plasticity during the critical period. Initially involved in embryonic head formation, Otx2 is re-expressed during the critical period of rats (>P23) and regulates the maturation of parvalbumin-expressing GABAergic interneurons (PV-cells), which control the onset of critical period plasticity. Dark-rearing from birth and binocular enucleation of rats resulted in decreased expression of PV-cells and Otx2, which suggests that these proteins are visually experience-driven. Otx2 loss-of-function experiments delayed ocular dominance plasticity by impairing the development of PV-cells. Research into Otx2 and visual plasticity during the critical period is of particular interest to the study of developmental abnormalities such as amblyopia. More research must be conducted to determine if Otx2 could be utilized for therapeutic recovery of visual plasticity to aid some amblyopic patients. ↑ Kastury K, Druck T, Huebner K, Barletta C, Acampora D, Simeone A, Faiella A, Boncinelli E (July 1994). "Chromosome locations of human EMX and OTX genes". Genomics. 22 (1): 41–5. doi:10.1006/geno.1994.1343. PMID 7959790. 1 2 "Entrez Gene: OTX2 orthodenticle homeobox 2". ↑ Verma AS, Fitzpatrick DR (2007). "Anophthalmia and microphthalmia". Orphanet Journal of Rare Diseases. 2: 47. doi:10.1186/1750-1172-2-47. PMC 2246098 . PMID 18039390. ↑ Zielinski D, Markus B, Sheikh M, Gymrek M, Chu C, Zaks M, Srinivasan B, Hoffman JD, Aizenbud D, Erlich Y (2014). "OTX2 duplication is implicated in hemifacial microsomia". PloS One. 9 (5): e96788. doi:10.1371/journal.pone.0096788. PMC 4016008 . PMID 24816892. ↑ Sugiyama S, Prochiantz A, Hensch TK (April 2009). "From brain formation to plasticity: insights on Otx2 homeoprotein". Development, Growth & Differentiation. 51 (3): 369–77. doi:10.1111/j.1440-169X.2009.01093.x. PMID 19298552. 1 2 3 Sugiyama S, Di Nardo AA, Aizawa S, Matsuo I, Volovitch M, Prochiantz A, Hensch TK (August 2008). "Experience-dependent transfer of Otx2 homeoprotein into the visual cortex activates postnatal plasticity". Cell. 134 (3): 508–20. doi:10.1016/j.cell.2008.05.054. PMID 18692473. Millet S, Bloch-Gallego E, Simeone A, Alvarado-Mallart RM (December 1996). "The caudal limit of Otx2 gene expression as a marker of the midbrain/hindbrain boundary: a study using in situ hybridisation and chick/quail homotopic grafts". Development. 122 (12): 3785–97. PMID 9012500. Larsen KB, Lutterodt MC, Møllgård K, Møller M (July 2010). "Expression of the homeobox genes OTX2 and OTX1 in the early developing human brain". The Journal of Histochemistry and Cytochemistry. 58 (7): 669–78. doi:10.1369/jhc.2010.955757. PMC 2889402 . PMID 20354145. Kimura C, Takeda N, Suzuki M, Oshimura M, Aizawa S, Matsuo I (October 1997). "Cis-acting elements conserved between mouse and pufferfish Otx2 genes govern the expression in mesencephalic neural crest cells". Development. 124 (20): 3929–41. PMID 9374391. Gat-Yablonski G (September 2011). "Brain development is a multi-level regulated process--the case of the OTX2 gene". Pediatric Endocrinology Reviews. 9 (1): 422–30. PMID 22783640. Béby F, Housset M, Fossat N, Le Greneur C, Flamant F, Godement P, Lamonerie T (2010). "Otx2 gene deletion in adult mouse retina induces rapid RPE dystrophy and slow photoreceptor degeneration". PloS One. 5 (7): e11673. Bibcode:2010PLoSO...511673B. doi:10.1371/journal.pone.0011673. PMC 2908139 . PMID 20657788. Hever AM, Williamson KA, van Heyningen V (June 2006). "Developmental malformations of the eye: the role of PAX6, SOX2 and OTX2". Clinical Genetics. 69 (6): 459–70. doi:10.1111/j.1399-0004.2006.00619.x. PMID 16712695. Simeone A, Acampora D, Mallamaci A, Stornaiuolo A, D'Apice MR, Nigro V, Boncinelli E (July 1993). "A vertebrate gene related to orthodenticle contains a homeodomain of the bicoid class and demarcates anterior neuroectoderm in the gastrulating mouse embryo". The EMBO Journal. 12 (7): 2735–47. PMC 413524 . PMID 8101484. Nagao T, Leuzinger S, Acampora D, Simeone A, Finkelstein R, Reichert H, Furukubo-Tokunaga K (March 1998). "Developmental rescue of Drosophila cephalic defects by the human Otx genes". Proceedings of the National Academy of Sciences of the United States of America. 95 (7): 3737–42. Bibcode:1998PNAS...95.3737N. doi:10.1073/pnas.95.7.3737. PMC 19906 . PMID 9520436. Bobola N, Briata P, Ilengo C, Rosatto N, Craft C, Corte G, Ravazzolo R (April 1999). "OTX2 homeodomain protein binds a DNA element necessary for interphotoreceptor retinoid binding protein gene expression". Mechanisms of Development. 82 (1-2): 165–9. doi:10.1016/S0925-4773(98)00162-2. PMID 10354480. Fong SL, Fong WB (April 1999). "Elements regulating the transcription of human interstitial retinoid-binding protein (IRBP) gene in cultured retinoblastoma cells". Current Eye Research. 18 (4): 283–91. doi:10.1076/ceyr.18.4.283.5360. PMID 10372988. Nakano T, Murata T, Matsuo I, Aizawa S (January 2000). "OTX2 directly interacts with LIM1 and HNF-3beta". Biochemical and Biophysical Research Communications. 267 (1): 64–70. doi:10.1006/bbrc.1999.1872. PMID 10623575. Takeda K, Yokoyama S, Yasumoto Ki, Saito H, Udono T, Takahashi K, Shibahara S (January 2003). "OTX2 regulates expression of DOPAchrome tautomerase in human retinal pigment epithelium". Biochemical and Biophysical Research Communications. 300 (4): 908–14. doi:10.1016/S0006-291X(02)02934-0. PMID 12559959. Martínez-Morales JR, Dolez V, Rodrigo I, Zaccarini R, Leconte L, Bovolenta P, Saule S (June 2003). "OTX2 activates the molecular network underlying retina pigment epithelium differentiation". The Journal of Biological Chemistry. 278 (24): 21721–31. doi:10.1074/jbc.M301708200. PMID 12663655. Puelles E, Annino A, Tuorto F, Usiello A, Acampora D, Czerny T, Brodski C, Ang SL, Wurst W, Simeone A (May 2004). "Otx2 regulates the extent, identity and fate of neuronal progenitor domains in the ventral midbrain". Development. 131 (9): 2037–48. doi:10.1242/dev.01107. PMID 15105370. Boon K, Eberhart CG, Riggins GJ (February 2005). "Genomic amplification of orthodenticle homologue 2 in medulloblastomas". Cancer Research. 65 (3): 703–7. PMID 15705863. Di C, Liao S, Adamson DC, Parrett TJ, Broderick DK, Shi Q, Lengauer C, Cummins JM, Velculescu VE, Fults DW, McLendon RE, Bigner DD, Yan H (February 2005). "Identification of OTX2 as a medulloblastoma oncogene whose product can be targeted by all-trans retinoic acid". Cancer Research. 65 (3): 919–24. PMID 15705891. Ragge NK, Brown AG, Poloschek CM, Lorenz B, Henderson RA, Clarke MP, Russell-Eggitt I, Fielder A, Gerrelli D, Martinez-Barbera JP, Ruddle P, Hurst J, Collin JR, Salt A, Cooper ST, Thompson PJ, Sisodiya SM, Williamson KA, Fitzpatrick DR, van Heyningen V, Hanson IM (June 2005). "Heterozygous mutations of OTX2 cause severe ocular malformations". American Journal of Human Genetics. 76 (6): 1008–22. doi:10.1086/430721. PMC 1196439 . PMID 15846561. Brunet I, Weinl C, Piper M, Trembleau A, Volovitch M, Harris W, Prochiantz A, Holt C (November 2005). "The transcription factor Engrailed-2 guides retinal axons". Nature. 438 (7064): 94–8. Bibcode:2005Natur.438...94B. doi:10.1038/nature04110. PMID 16267555. Chatelain G, Fossat N, Brun G, Lamonerie T (July 2006). "Molecular dissection reveals decreased activity and not dominant negative effect in human OTX2 mutants". Journal of Molecular Medicine. 84 (7): 604–15. doi:10.1007/s00109-006-0048-2. PMID 16607563. Heimbucher T, Murko C, Bajoghli B, Aghaallaei N, Huber A, Stebegg R, Eberhard D, Fink M, Simeone A, Czerny T (January 2007). "Gbx2 and Otx2 interact with the WD40 domain of Groucho/Tle corepressors". Molecular and Cellular Biology. 27 (1): 340–51. doi:10.1128/MCB.00811-06. PMC 1800652 . PMID 17060451.